There are many fascinating and unique wedding locations of historical nature in Northern California and Nevada where brides and grooms can opt to marry, and three mentionable ones are Valhalla Grand Hall, Saint Mary in the Mountains, and Gold Hill Hotel. Each of these historic landmarks – all of which are in close proximity to illustrious Lake Tahoe – contain a stirring history that engenders a compelling quality, only one of the many reasons why these wedding venues are an enticing place for a matrimonial encounter. 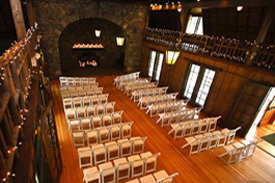 Nearby the south shore of Lake Tahoe just north of Camp Richardson lies a beguiling, rustic Scandinavian-style edifice that plays host to various events, including weddings and receptions. Valhalla Grand Hall is quite an elegant place that has an elevating past. 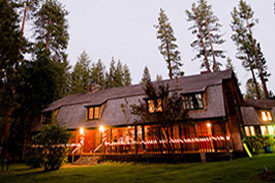 Situated on the Tallac Historic Site, the hall was built in 1924 and was the home of the pioneer Heller family. The Heller estate was envisaged by a prominent investment broker, Walter Heller, in San Francisco in 1922. The towering pine trees of the national forest encircle Valhalla, creating an ambiance of serenity and tendering an effect of complete privacy for your event. Masterfully fashioned decor, attractive double French doors that lead out to a lodge pole crafted walkway that wraps the building, a balcony overlooking the main ceremony area, and an exceptionally large twenty-foot stone fireplace are only a few of the grand hall’s prestigious features. Valhalla Grand Hall is one of the more premium wedding and event venues in the neighboring area. The hall is suited best for large, formal parties, accommodating up to an approximate 120 guests. The oldest Catholic Church in Nevada is St. Mary in the Mountains. 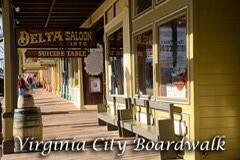 The account of this historic landmark dates back to the 1800’s at the onset of the silver and gold mining days of Virginia City, which is now a well-preserved, touristy ghost town. The original church’s wooden structure collapsed shortly after being built in 1860, and its replacement came four years later. The explosive population growth due to the Comstock Lode silver strike was cause for a new structure to be erected, holding its first service in 1870. Unfortunately, it was destroyed in 1875 by what has been termed as “The Great Fire”, and much of the town of Virginia City met similar fate. 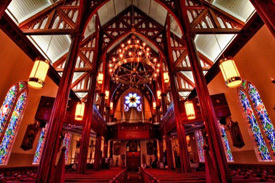 The church that stands today was rebuilt in 1876 and is a sight of grandeur and beauty. 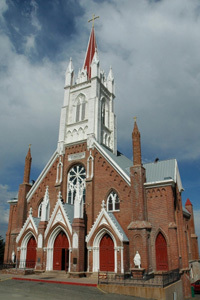 The church spire measures an approximate 140 feet tall, and the original 2,264 pound bell – which first rang in 1870 during services of the preceding church – survived the fire of 1875 and is now a part of the present day construction. The bell contains an enormous one hundred pound clapper and is still operational. Other superlative features contributing to the opulence of this remarkable cathedral include the Gothic styled interior, a choir loft and galleries, and a French imported twenty-one foot alter. An extraordinary ecclesiastical composition of such stature is unquestionably a wedding site worth exploring by the marriage minded who prefer distinction. Tucked away in the hills of Nevada in a setting of an inviting ghost town embraced with plenty of “Old West” history, St. Mary in the Mountains Catholic Church is a perfect place for a unique and impressive wedding experience. Constructed around the year 1860, the Gold Hill Hotel played a vital role at the time of the “Big Bonanza”, the culmination of silver abstraction from the mines of Virginia City in 1870, also known as the Mother Lode. The hotel is the oldest in Nevada and lies just south of the former bustling mining town. 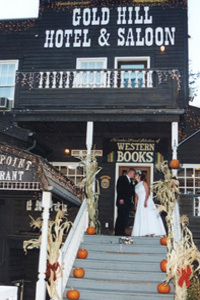 Overlooking Gold Canyon, the age-old hotel has several ceremony and reception areas to choose from. The “Great Room” encompasses a decor of merit, stimulating a feel of amorous charm. The Victorian epoch styled furniture in addition to the hoary winding staircase add considerably to the room’s fascination. Outdoor weddings are also an option at Gold Hill. Located next to the Brewery Lodge, ceremonies at the gazebo deliver pleasing sights of the Sierras in a setting of pleasantly arranged landscaping. Receptions can also be held outdoors at the gazebo, if desired. Historic wedding sites with intriguing pasts are bountiful in both Northern California and Nevada, and Valhalla Grand Hall, St. Mary in the Mountains Catholic Church, and Gold Hill Hotel are just a handful of the choices available to couples looking to marry in extraordinary places. The distinctive traits each of these venues extend will provide the bride and groom and their guests a unique wedding experience, imprinting an enduring memory of a very special place and time. 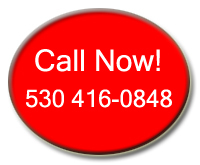 More outstanding wedding locations in Northern California and Nevada that may be a consideration for those seeking to marry are situated around the shores of Lake Tahoe. Many popular outdoor ceremony venues in Tahoe exist lakeside, offering astounding views of the lake and surrounding Sierra Nevada Mountain Range. For more information or assistance with planning a Tahoe wedding, give us a call at (888) 896-4656 or visit the website of Alpenglow Weddings in Lake Tahoe.